McKinsey & Co put out a treasure trove of data about the size of stock and bond markets around the world in an August 2011 publication, “Mapping Global Capital Markets 2011”. Below is a chart about the size of the global markets, and the relative size of outstanding bonds and stocks. The table shows global bonds to be $157 Trillion out of the total $212 Trillion of capital stock (bonds and stocks) with stocks at $54 Trillion. That puts bonds at about 75% of capital, and stocks at about 25% of capital globally. Separate data about the US from SIFMA, puts the US bond market at just under $37 Trillion (including municipal bonds) as of the end of 2011 (a year later than the McKinsey data), and Bloomberg puts US stocks now (April 2012) at about $21.4 Trillion. By Subtraction, non-US debt outstanding is $120 Trillion, and non-US stocks at $32.6 Trillion. US bonds are about 23.6% of world bonds outstanding, which compares well with the 26.4% weight that PIMCO puts on US bonds in its GDP weighted world bond fund, PSAIX – always good when different data sources tend to agree. FTSE puts the US stock market at 45% of world stocks (as reported by Vanguard for their world fund VT) . 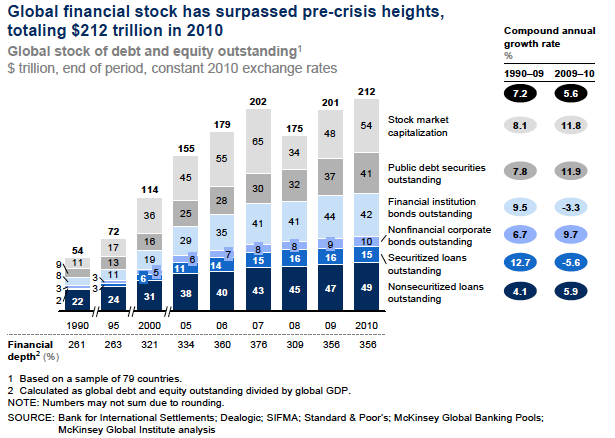 Applying that percentage to the $54 Trillion of world stock market-cap at the end of 2010 from McKinsey. we get US stocks total market-cap of $24.3 Trillion. As a cross-check, the sum of the market-cap of the NYSE, NASDAQ and AMEX on Bloomberg today (04-02-2012) is $21.4 Trillion — pretty close numbers for the kind of data gathering these summaries involve. Going with the SIFMA and Bloomberg numbers, the US capital market is about $58.4 Trillion, consisting of 63.4% bonds and 36.6% stocks. This entry was posted on Monday, April 2nd, 2012 at 3:39 PM and is filed under Data, Interesting Charts. You can follow any responses to this entry through the RSS 2.0 feed. Both comments and pings are currently closed.